The Phase II saga of the MCU (Marvel Cinematic Universe) has offered plenty of comic superhero thrills, expanding upon its signature characters while also adding new ones to its ever-growing roster. From Tony Stark’s solo adventure in Iron Man 3, to the Thor’s encounter with the dark elf Malkeith in Thor: Dark World, to the fall of S.H.I.E.L.D in Captain America: Winter Soldier, to a galactic band of misfits in Guardians of the Galaxy, and, more recently, seeing the return of Earth’s Mightiest Heroes in Avengers: Age of Ultron. Indeed, the MCU Phase II saga has captured some truly standout moments, weaving comic book frivolities and big summer blockbuster action into its five feature film collection. However, like all good things, it must come to an end as the film Ant-Man, Marvel’s tiniest hero, is the final cinematic tale in the Phase II saga. Does this pint-size superhero have what it takes to stand tall in the MCU or is it too small to even notice? 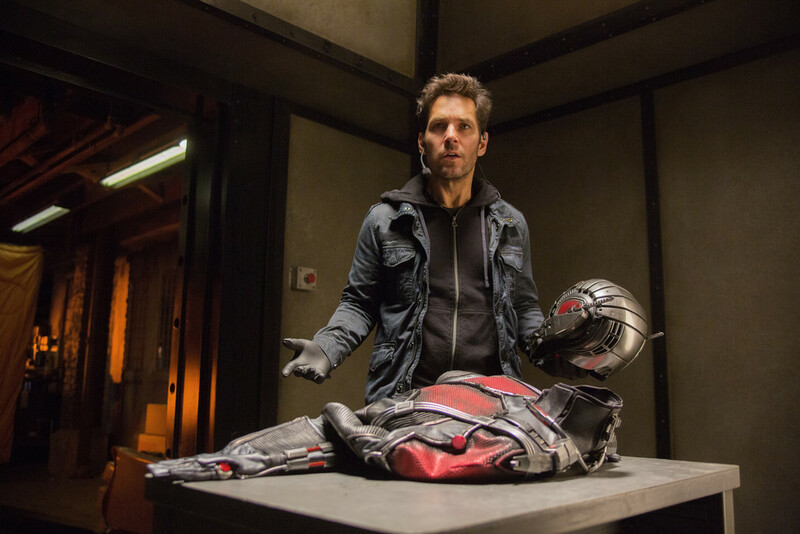 Fresh out of jail, Scott Lang (Paul Rudd), an exemplary burglar, has just left prison, serving his sentence and ready to get his life back on track in order to spend time with his young daughter. However, his past criminal records tarnish his chance at future employment, forcing Scott to take up his bad habits again and break into a wealthy mansion with his ex-cellmate Luis (Michael Pena). After successfully breaking into a mansion’s fortified safe, Scott, believing that he’s found fortune and wealthy, reluctantly only finds a special suit. Putting on the suit, Scott Lang experience the marvels and technology of Ant-Man, guided by its inventor, Dr. Hank Pym (Michael Douglas), who’s been looking for someone to become a superhero with the unique ability to shrink down to the size of an ant. 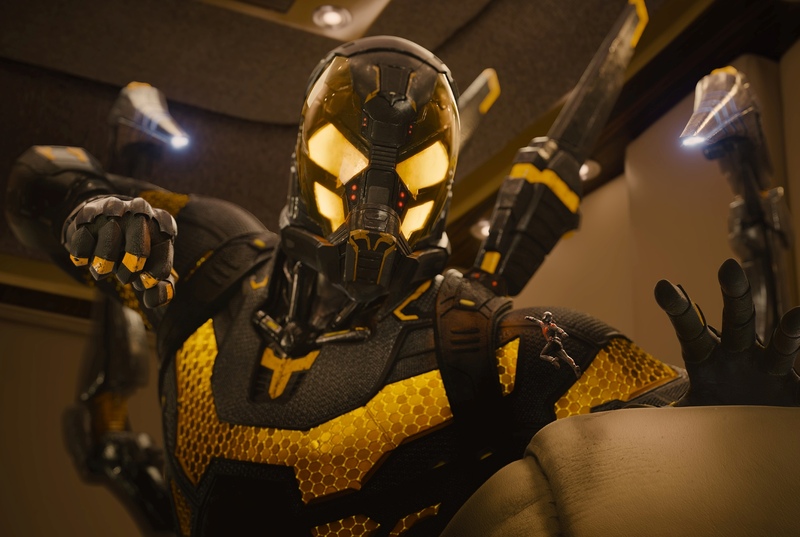 While Hank and his daughter Hope (Evangeline Lily) begin to teach Scott in learning how to control and master the ways of Ant-Man, Hank’s protégé, Darren Cross (Corey Stoll), is about to unleash his fury with the Yellowjacket suit, a Ant-Man tech suit that threatens to all with its weaponized applications. Of the five films of Marvel’s Phase II saga, I personally thought that Guardians of the Galaxy was the best. One of the main reason I liked it was because Marvel, rather than produce another superhero sequel to an already established character, explored the idea of new comic book heroes while also broaden their horizons within their own cinematic universe. It was something new, refreshing, and different from its other Phase II films (but in a very positive way) that pay off big time. Following the box office success of Avengers: Age of Ultron, Ant-Man (the 12th film in the MCU) arrives in theaters, attempting to emulate the effect of being “new” and “different” in a similar fashion to what Guardians of the Galaxy culminated last year. To its effect, it sort of does, bringing a certain style to this origin story / non-sequel of a movie, but not as grandiose or as celebrated as Star-Lord and his ragtag team achieved. Ant-Man, regardless if it’s successful or not, will always have the inherit “What if?” stamp on its theatrical release, referring to losing the film’s director / writer Edgar Wright as the movie was in the thick of pre-production. Faced with this challenge, Peyton Reed, director of Yes Man and The Break Up, was selected to take over the directorial position of Ant-Man. Reed manages helm in the film in the right direction, allowing writer Adam McKay and actor Paul Rudd to rewrite Edgar Wright’s original script for Ant-Man. Though Reed does try and fix certain things, interjecting his own style to the superhero feature, there are a couple of times when you get a sense of what’s Wright’s work and what is Reed’s work, creating some unbalanced tonal shifts. Given the outlandish premise of a man in a shrinking suit, who has superhuman strength and reflexes while also possessing the ability to manipulate ants to aid him, the movie, for the most part, doesn’t take itself too seriously. Yes, just like Guardians, the movie has a more comedy than most Marvel movie, offering a blend of funny humorous parts with superhero action. While the film’s jokes and gags don’t always land properly or not as uproariously funny, it’s still a welcomed notion that Marvel is trying a different approach to superhero moviemaking. From the superhero genre standpoint, Ant-Man feels mostly generic (possibly formulaic) in way that’s similar to other Marvel origin stories. It’s the status-quo of familiar beats in narrative storytelling that consists of three predictable acts that have little to no surprises / twist within its undertaking. There’s plenty of MCU references made in the film (past, present, and possibly future installments), which will please diehard fans, but Ant-Man’s connections to these references are somewhat irrelevant in its own movie, pulling focus away from its own storyline in favor of “connecting the MCU dots”. Visually speaking, Ant-Man’s effects shots are the movie’s big draw and are practically worth the price of admission. Imagining up a micro world for the film’s main protagonist, Reed seems to channel a Honey, I Shrunk the Kids concept vibe with Ant-Man, placing Scott in a familiar but gigantic world with plenty of dangers along the way. Many of these sequences are exceptional executed with CG effects that are creative and crisp, allowing viewers to experience Scott’s perspective as he escapes, infiltrates, and discovers the everyday threats of a small creature in a big world. Thus, if you have extra cash to spend, go see Ant-Man in IMAX 3D. It’s definitely worth for the visuals alone. The movie’s action scenes are executed and choreographed well, creating elaborate and interesting fight sequence. The ending fight between Ant-Man and Yellowjacket is actually truly neat to see. 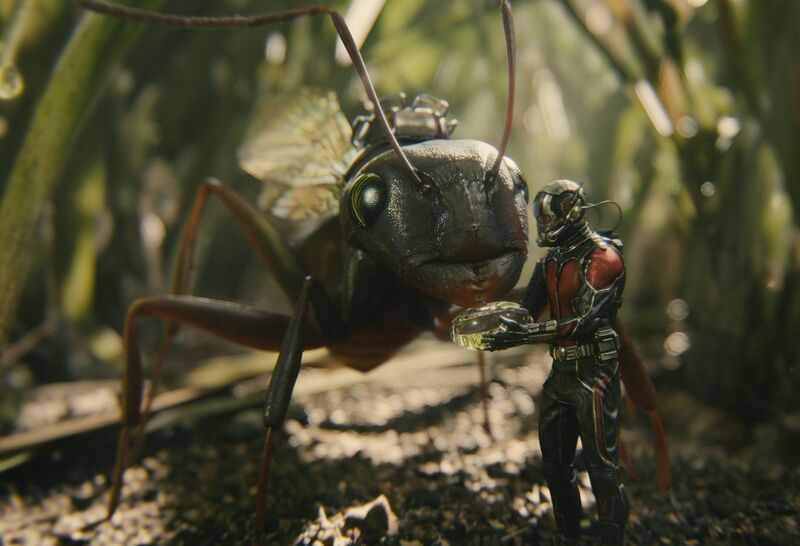 In terms of the film’s scale and scope, Ant-Man feels small (no pun intended). While other Marvel features offer up lavishing areas of big-time action, Ant-Man is on a smaller scale that, to me, doesn’t work well for a superhero movie, especially a Marvel one. Some might like this more consolidated scope for the movie, but personally I didn’t like it. When it was announced that actor Paul Rudd was casted as Scott Lang, many believed, including myself, that Rudd, who mostly does raunchy comedy movies, wasn’t the right fit for a leading man in a Marvel movie. However, after seeing the film, I put my doubts to rest as Rudd turns a believable performance in Scott. He’s not the most obvious choice for main character, but he has a likeability about him that works for this particular movie, utilizing his rhythmic comedic presence on-screen while also dishing out the superhero bravado when called upon. In short, well he may not be the most ideal person to be casted as a lead superhero, Paul Rudd’s Scott Lang is enjoyable and entertaining. Following the footsteps of veteran actors of Hollywood like Anthony Hopkins, Robert Redford, and Glen Close, Michael Douglas joins the MCU cast of actors, lending his weight to the film as the character Hank Pym. Douglas brings his theatrical gravitas the feature, dishing out dialogue lines and dramatics emoting scenes with great ease as well as scenes that require humor. Again, a great addition to the cast of seasoned Hollywood actors who have joined the Marvel’s cinematic family. From she-elf warrior in The Hobbit trilogy to the daughter of Hank Pym, Evangeline Lilly plays Hope Van Dyne with enough theatric drama, allowing more personality and depth in her character while also eluting to her possible role in future Marvel movies. 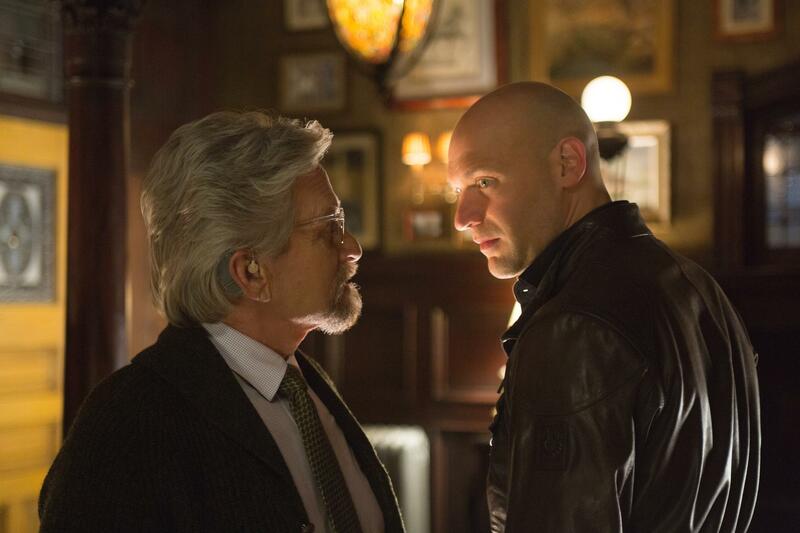 The film’s antagonist is the character of Darren Cross, played by actor Corey Stoll. Stoll, who is a talented actor, comes across as generic superhero baddie that feels underdeveloped. I’m not saying it’s his fault (Stoll gives what he can to the role), but rather to the writer’s for not fleshing the character out. However, once Stoll’s Darren Cross dons the Yellowjacket suit, the character (from a visual / physical standpoint) becomes more interesting. I personally like the design of the Yellowjacket suit versus the suit for Ant-Man. In more supporting roles is a colorful trio consisting of Michael Pena as Luis (an ex-cellmate / friend to Scott Lang) and his two criminal colleagues T.I.’s Dave and David Dastmalchian’s Kurt. These three, serve more as comic relief for the feature, but it’s Pena who shines the most with his goofy performance. Lastly, actors Wood Harris, Bobby Cannavale, and Judy Greer lend their talents to Ant-Man in very minor supporting roles, but make the most of the screen time that they are given. As always, stay tuned after the movie for two secret endings. I won’t go into detail about these scenes, but they do further cement Ant-Man in the MCU as well as foreshadowing events in future installments. Ant-Man is an interesting movie to close out the Phase II saga. It’s somewhat silly premise could’ve made the film a flat-out “dud”, but at least the film as a few saving graces up its sleeve, most notably in creativity, visuals, and performances. While there are some notable flaws in its genetic superhero makeup, the movie is still enjoyable as good wholesome comic book entertainment. Those looking for bombastic ultra-big-action blockbuster thrills will be underwhelmed with the presentation found in Ant-Man (I was a little bit). But if you’re looking for a smaller and more simplistic superhero movie, then Ant-Man has enough fun, charm and interesting elements to overlook it’s obvious tones of formulaic familiarity. The Phase II saga has now official ended and, with all the pomp and circumstance that’s been promised in the upcoming Captain America: Civil War (due out next year), Marvel’s Phase III saga is going to start off with a grandiose bang.